in one of the most crazy competitive, saturated & overcrowded online industries! Stop looking & sounding like everybody else & create a brand that’s an extension of the extraordinary woman you are? Get to know your ideal clients better than they know themselves – without doing another annoying client avatar? Grow a rabid following & a list full of “right people,” fast? Put out a value-packed freebie, opt-in or lead magnet that’s SO undeniably perfect for your people that they download & share it in droves? Learn the mindset secrets of millionairesses, so you can learn how to think – and earn– like one? Love up your list (in all the right ways) so your readers don’t just obsess over your content, but actually want to buy from you? Knock it out of the park – and land new clients – every time you book a discovery call? Stop being seen as “just another coach” and stand out like a fabulous pink flamingo in a sea of bland, boring coaches? ...Or maybe ALL OF THE ABOVE? You CAN do it ALL – without the overwhelm, exhaustion & “OMG, am-I-even-doing-this-right?” feeling you have right now. All you need is a simple roadmap with fail-proof steps. I get you, gorgeous. If you’re over trying a million different strategies to market & grow your business without having the overflowing funds, flexibility or fabulous shoes to show for it... Why not stop trying to do it all, and start doing what works? I went 9 months in my business without booking a single client. I spent the first year of my business almost completely clientless. And when I did start booking them, I was selling coaching sessions for a measly $27 from my bathroom floor – to people who were SO not meant to work with me. Things got so bad, I even thought about hawking my glittering engagement ring to pay rent. Ugh. I. Know. It wasn’t like I wasn’t trying to succeed. In fact, my problem was that I was trying TOO hard! I signed up for every free webinar out there. I devoured free e-books like they were free glasses of Rose. 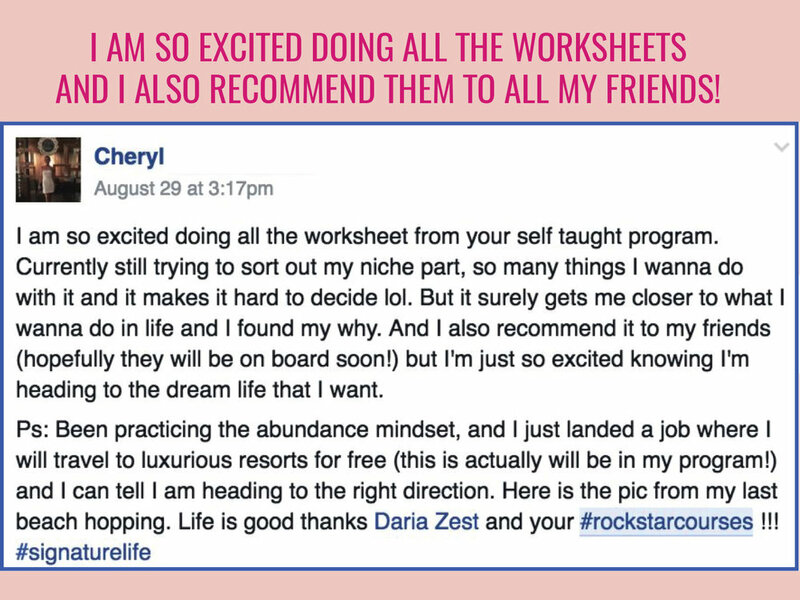 And I spent a fortune – not to mention wasted hours of my precious life I’ll never get back – taking #ALLTHEPROGRAMS without seeing real results. I was lost. I was confused. And I still didn’t have the business or life I imagined. One day, I finally realized that stuffing my brain with more information – and more strategies – was NOT the answer. I didn’t need to learn more – I needed to do less, just better. When I hyper-focused on just a few specific, strategic marketing activities, my business exploded with paying clients! Almost right away, I started making consistent 5-figure months... even though I’m in the one of the most "competitive, saturated, and overcrowded" industries out there! In fact, I made my first $10k in just 20 days! This wasn’t just a fluke or “good luck.” I went on to have $30k, $40k and even $50k months. By the end of the year, I had made $200k in my first year in business. Yep – in just 12 months, I had doubled my corporate salary and the unfeasible (or so I thought) goal I set when I sashayed my way out of my Fortune 500 corporate job! WHEN YOU HYPER-FOCUS ON THE RIGHT STRATEGIES, THEY WORK. That is exactly why I have created these 6 super-affordable, signature self-study courses. To show you the strategies that work. No more. No less. I’ve invested over $100k to learn this high-level information so you don’t have to! Instead, I’m lavishing you with these proven, tested and vetted strategies – the juicy stuff I normally only share with my private clients. In the courses you get access to my BEST stuff at a cost far less than Sunday brunch. You get access to audio and video recordings of my most popular livestream challenges (that got 1000+ likes and comments online), and trainings, PLUS each course has a workbook included - yes, we are giving you everything you need, and nothing you do not need. Fast. Efficient. Fabulously Simple. (& Stylish). Take a sneak peek at our membership site where all the courses are instantly available to you online on any device. HAVE YOU PRAYED FOR AN EFFECTIVE-YET-AFFORDABLE HELP? We've heard your prayers, girl! IT’S TIME TO DO LESS, BUT BETTER. WITH MY 6 SIGNATURE SELF-STUDY COURSES! You absolutely have to check this out if you want to stop feeling like an unworthy fraud and start thinking (and earning!) like a millionaire! Get an insider’s look at my signature mindset tool – aka the one simple thing I do regularly that helped me quit my job & jet-set to 16 destinations in 12 months! You need this if you’re done having a boring brand & you’re ready to be a true flamingo in the sea of coaches! How to make your lifestyle a part of your signature brand, while getting a secret behind-the-scenes look at my business! Design a brilliant sales pitch so you can eloquently answer the question, "So what do you do?" You've gotta have this if you want to grow your list and following with the right people fast! You must try this if you want to nurture your list of subscribers so that they don’t just want to buy from you, they practically have to! My fail-proof Sales Funnel Formula – the exact system I used to sell out my 1-on-1 practice and 2 group programs three times in a row! Why people REALLY don’t buy after the call – and how to fix it so they do! Your dream life and business isn’t nearly as far away as you think it is, babe. Women just like you are making it happen every single day. EVERYTHING THAT YOU'VE BEEN ASKING FOR IS JUST ONE STEP AWAY - WILL YOU MAKE THE STEP?